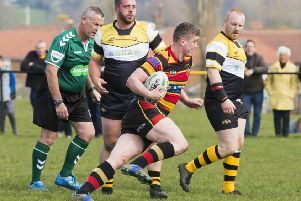 Halifax Vandals clinched promotion to Yorkshire Two after a brutally impressive second half performance gave them a 36-13 victory away to Harrogate Pythons. They scored 24 unanswered points after the break to deliver another bonus point victory and Knottingley’s defeat at Northallerton ensured they will play at their highest level for 25 years. “At that stage we were playing a naïve brand of rugby and not really playing to our strengths,” he said. “We were going wide too early and not using our forward power to dominate teams. “Although we got well beaten at Knottingley it was a definite turning point in our season. Jamie (Bloem) changed the game plan to a simpler system which built forward momentum and we haven’t looked back. Vandals require nine points from their last two games to hold on to their slim lead over Goole at the top of the table. The first half at Harrogate was reminiscent of those dark early season games as Vandals turned in a dreadful 40 minutes against a resolute and robust Pythons team. They got off to the worst possible start. A poorly placed kick was well gathered by Harrogate and a fine counter attack led to impressive left wing Gareth Bass making light work of the Vandals defence to sprint over in the corner. Vandals hit back strongly and after impressive driving play from Burnside and Harris, Hamer was held up over the try line. From the subsequent scrum Hamer worked a well rehearsed switch with Gallagher who crashed over for a well worked try, brilliantly converted by Jimmy Crowther. Pythons then went up a gear and dominated for 20 minutes. A driving maul was repelled but quick ruck ball resulted in non existent Vandals defence and an easy try. Bass trampled over the Vandals defence at will and was just being held up over the line. Eventually the pressure was eased and Vandals established a driving maul which committed the Pythons defence. Hamer took advantage of the space and made ground. A superb pass from Gallagher put Tom Crowther away and Bryson touched down for a 12-10 lead. The rest of the half was all Harrogate and they were unfortunate to only have a well kicked penalty and a one point lead as reward. For the second week in succession player/coach Bloem read the riot act to good effect. The second half was exclusively Vandals. They played a simple and direct game putting Pythons under huge pressure. Careless mistakes frustrated them but eventually the inevitable happened. The effervescent Sutcliffe broke clear and Gallagher brushed aside several defenders before diving triumphantly under the posts. Vandals swept back down field and retained possession for extended periods Carrington, Jowett, Richardson and the impressive Maeer made good ground. A knock on appeared to have brought momentum to a halt but as Pythons tried to move the ball wide to Bass a long pass was snaffled by Tom Crowther for a fine interception score. This provided the much needed bonus point. Vandals were now unstoppable and Gallagher was dictating play behind the dominant pack. Binns was making great ground and the rumbustious centre knocked defenders asunder to score a well-deserved try. Binns made another impressive break and from the resulting ruck Harris crashed over for the final try, well converted by Crowther.